Great Lakes Skipper distributes premium quality boat seats. 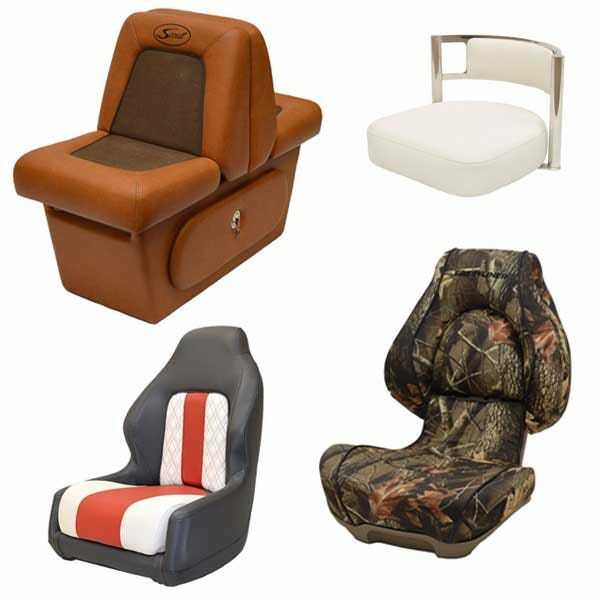 We carry a large inventory of boat seats that includes fishing seats, pontoon boat seats, helm chairs, captain chairs to folding fishing boat seats, bucket seats, swing back seats, swivel boat seats and more. Whatever your boat seating need, we have hundreds to choose from. Are you looking for the right vinyl or upholstery to complete your custom boat seat covers? Look no further than Great Lakes Skipper. We carry miles and miles of boat upholstery and marine vinyl to give you the hottest boat seat on the high seas! And don't forget that we carry all the boat seat accessories you will need. So whether you need the boat seat, the fishing seat covers or the seat pedestal hardware, look no further that Great Lakes Skipper for the largest online selection from the best marine manufacturers in the business. Just a friendly reminder . . . we are importing thousands of marine products every month.